I had the privilege of being the event planner for Mt. 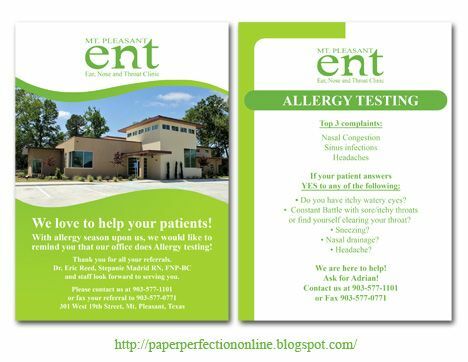 Pleasant Ear, Nose and Throat Clinic's Grand Opening for their new clinic and they contacted me again to help market their allergy testing this spring. They knew they wanted to give out cookies to doctors that refer patients to them for allergy testing and needed a card to go with the sweet treat. Here is the card that I created for them using the wording they sent me. If you need help creating a custom card for your next event contact Paper Perfection at jtanddolly@yahoo.com for pricing and details.